There are plenty of 'Hot Pocket' types of foods out there. And you'll find lots of nice vegetarian versions too. This is the version my family loves for lunch. 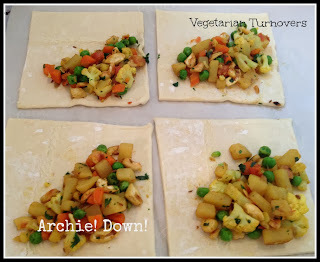 Set your puff pastry on a cookie sheet. If frozen allow to thaw. Meanwhile heat the cooking oil and add the cumin seeds. Let them sputter for a moment and then add the onion. Sauté until starting to brown and add spices. Stir and then add all remaining vegetables except the peas. Sauté until the potatoes and carrots are cooked. You may add a little water while cooking, just make sure the final product hasn't any liquid gravy. Add the peas and cilantro and heat through for a few more minutes. Season well with salt to taste. Remove from heat, allow to cool. Once cool mix in the cashew nut pieces. Heat oven to 400 F, or pastry manufacturers recommendation. Cut the puff pastry sheets into four squares each. Top half of the square with filling. Paint the two sides of the bottom part of the pastry with the egg mixture to seal. Fold the other part of the square (so it turns into the classic triangle turnover shape) over the filling and seal the sides. Paint the top with the egg mixture and place the tray in the oven. Allow to bake until the turnovers are golden brown. 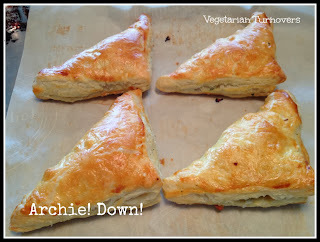 We enjoy the turnovers served with a spicy ketchup (mix Sriracha and Ketchup) and a cool salad on the side. If you buy or make vegan puff pastry, and omit the egg glaze these turnovers are easily made vegan.